Barcelona faced PSG in Paris for the first leg of the Quarter Finals. Barcelona dominated the game in what was another world-class showing for Lionel Messi. Messi’s reaction to PSG’s asymmetrical 4-4-2 along with Barcelona wing-combinations resulted in the 1-3 away win for Lucho’s men. PSG’s defensive game plan resembled Real Madrid’s in the recent El Clasico. They defended in a 4-4-2/4-3-3 type shape which had a focus on congesting the left side of the field and leaving the right side of the field open. PSG’s defensive strategy to overload the left flank and open the right flank. Normally, teams will look to congest the center and then isolate the flanks once the ball moves wide as a defensive strategy. This strategy focused mainly on congest the left flank and the center while leaving the right halfspace and right flank unprotected by the PSG forwards. Matuidi played as the left-central midfielder and move towards the left flank on defense as Pastore would stay higher up the field as the left-winger (similar to Cristiano Ronaldo). Cavani played as the central striker on defense and Lavezzi dropped into the midfield line on the right flank. This means that the right flank was open for Rabiot and Lavezzi to press while Cavani and Pastore paid extra attention to the left flank. The main goal of the asymmetrical strategy was to make the ball move away from Lionel Messi – who has been playing as the right winger under Lucho. In the game against Los Blancos, Lionel decided to move into the center of the field around the 50th minute after a goal by Suarez and that resulted in Barcelona controlling the rest of the match and winning the game. Matuidi answering Messi’s movements towards the center with man-marking. 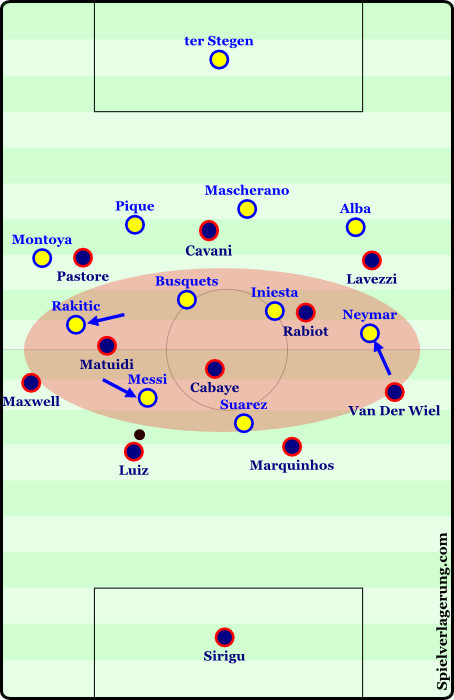 In this match against PSG he made the move towards the center relatively early and Barcelona had a much easier time dealing with PSG’s defense than they did Real Madrid’s defense. Before he moved completely into the center he made a few diagonal inside movements during combinations with Montoya and Rakitic – when he made those movements Matuidi would man-mark him until he moved back out onto the flank. Another aspect of PSG’s strategy was their counter attacks stemming from their asymmetrical defensive shape – they looked to break down the flanks with the running power of Matuidi and Lavezzi while Pastore was very supportive towards the left flank along with Maxwell. They looked to create down the left flank most frequently with combinations and then crosses into Cavani and into Rabiot’s vertical runs towards the goal. Barcelona adopt a 4-4-2 shape to balance Messi – similar to how Real Madrid balance Ronaldo. It could be better, but it works! Barcelona’s defense also took on the asymmetrical look because of their answer to Lionel Messi’s lack of defensive work rate. Lionel Messi would stay higher up the pitch (though he moved towards the center more frequently so the shape was purely asymmetrical) next to Suarez while Neymar dropped deeper and Rakitic took up the role on the right flank. This shape provides them with some stability while accounting for all of the characteristics of the players in the team (like Messi’s lack of defensive work rate and Neymar’s willingness to work hard balances each other quite well). This also means that Barcelona transition through the flanks with Neymar and Messi – which is very good. Later on in the game when Messi moved to the central-striker role permanently it was Suarez who took up the role on the right flank – but he dropped deeper and Barcelona looked more like a 4-1-4-1. From this general shape they performed similar pressing movements s they had under Guardiola with the left-central midfielder (Iniesta/Xavi) stepping up next to the striker and creating a 4-4-2esque press. Example of a pressing movement leading to a trap in a 4-1-4-1 from the link below. The press resembled a 4-1-3-1-1 more though – creating pressing traps within the 4-1-4-1 shape, you can find the variations of pressing traps in a 4-1-4-1 here one Spielverlagerung! Even though PSG had a sound defensive strategy, they weren’t very coordinated when defending. Even the untrained eye could see that Barcelona’s players were playing within PSG’s defensive shape with ease. David Luiz coming on definitely didn’t help – as he’s known for his awful preparation for scenes and positioning in general. He later was nut-megged/panna’d by Suarez twice before conceding a goal each time in part to his poor positioning and preparation for the scenes that were about to occur – though he was injured prior to the match so he doesn’t deserve that much stick. The defensive shape as a whole lacked coordination in pressing to react as a compact chain movement to the ball and cover each other’s movements. Not only that, there was a lack of proper preparation for their pressing movements – meaning they began in inefficient positions when attempting to press as a team. This sort of approach combined with their intentionally exposed right flank lead to Barcelona’s success in the game. 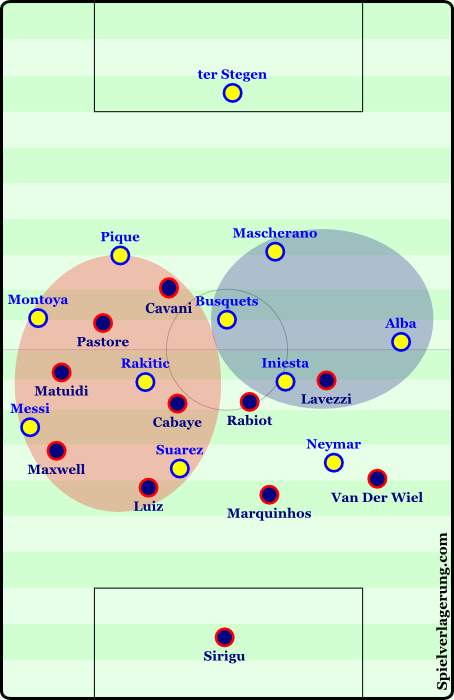 On the left flank (PSG’s right flank) Barcelona created with combinations between Alba, Neymar, and Iniesta. With the above-mentioned deficiencies in PSG’s defense, this made it easy for 3 world-class players to create dangerous attacks. 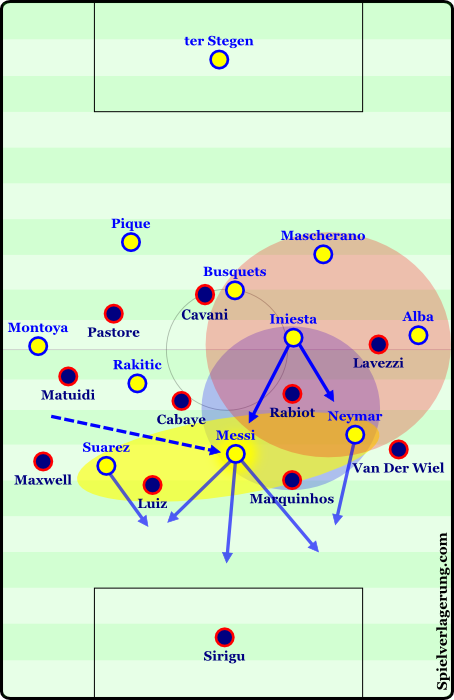 The structure of the flank combination of the left was as usual – Alba moves vertically down the touchline adding his speed and penetrative runs, Neymar begins near the touchline and uses Alba and Iniesta as “blockers” to move inside diagonally and dribble to create dangerous situations, and Iniesta played towards the center of the field with very supportive moment and a large presence in the possession game overall. 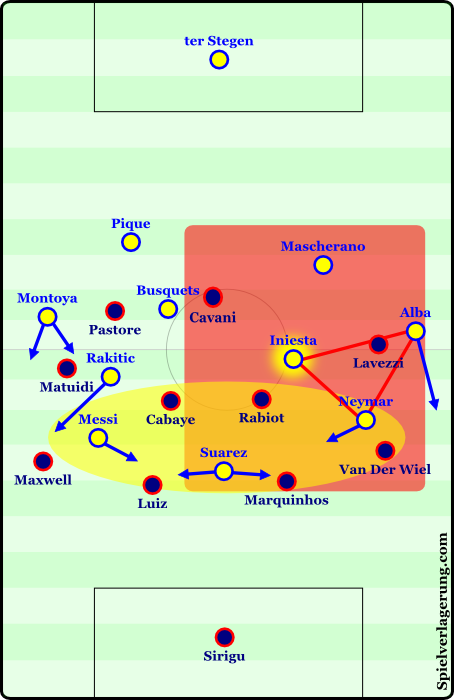 The red zone shows Iniesta’s increased area of influence under Lucho. The yellow zone and movements on the flanks highlight Barcelona’s current strategy to use the flanks and move their creative wingers inside as a main form of attack. Iniesta’s role over time (and specifically in this time with Lucho) has changed. He is no longer so focused on penetrative dribbling and moving between the midfield and defensive lines of the opponents – the more vertical role now belongs to Rakitic, who moves between the lines and out towards the flanks in order to balance Messi’s movements, press the ball, and create dangerous situations with his penetrative runs and shooting. He now has a Xavi-esque role where he looks to support the ball as much as he can and create spaces for other players (such as Neymar) to play into – though at times he still performs the dribbles and positions himself quite high like we are used to seeing. The strategy of Barcelona under Lucho focuses on the wingers creating from wide combinations and moving inside rather than the strategy of playing through the center and creating from there – like under Pep Guardiola. Xavi later came on for Iniesta and played the role (which he is considered the godfather of) and did very well. Xavi made excellent passing decisions, played into very tight angles, and controlled the game very well. Messi’s movement into the center connected him to the advantageous zone more directly. The red zone is the original area of superiority due to PSG’s shape. The blue zone shows the advantageous situation that stems from the red zone and Messi moving inside. The yellow zone highlights Barcelona’s structure when attacking the back line after penetration, using Messi as the main attacker – Neymar scored the 1st goal like this! 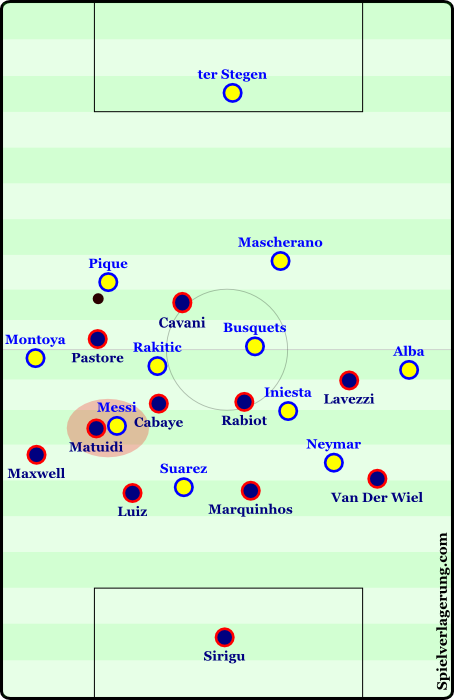 Messi’s reaction to PSG’s defensive strategy against him was to move completely into the center and make Suarez move out to the right flank – though they still switched positions at times. 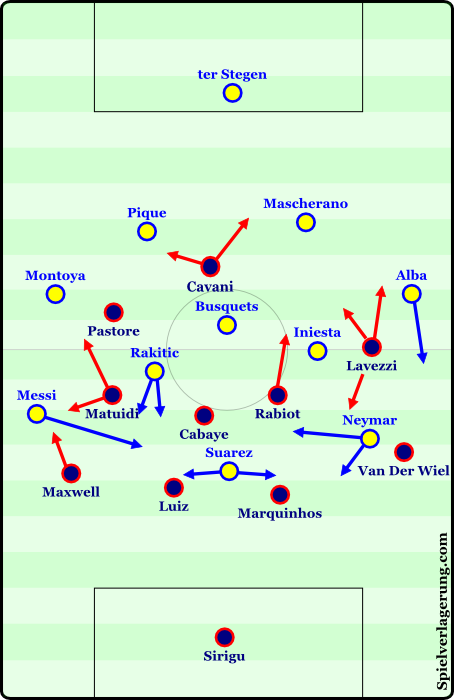 This was especially intelligent as this meant he was directly connected to Barcelona’s advantageous zone – the combinations on the left flank. The first goal came when Iniesta played the ball from the left halfspace into Messi (who was in the center), Messi then dribbled forward and played Neymar through the defense to score. Lucho has mentioned that Messi decides where he will move on the field and tells others what to do – like when Messi made the switch to the right-winger role and told Suarez to stay in the center. This was yet another move during a high-level game where it’s beginning to feel like Messi has a high level of tactical intelligence – even if on an intuitive level (if Lucho is telling the truth! PSG later put Lucas in for Rabiot and moved Pastore to right-central midfielder and Lavezzi to right-winger. They focused largely on penetrating with combinations down the left flank and shooting from there (or switching the ball to Lucas/Cavani on the weak-side in a more controlled manner), which proved a much more successful plan than their original one. The 1-3 loss at home for PSG makes for an almost impossible comeback in the second leg, but they made the proper adjustments against Chelsea after a poor first leg and managed to advance from the Round of 16 after doing so. If Blanc (who is quite underrated) can make the proper adjustments once again, then the situation looks a lot brighter for PSG. On the other side, Barcelona are still in the running for a possibly historic season – and with Messi growing more comfortable with making changes in positions as the problems occur within a game, Barcelona are looking even more dangerous. The same movement from the flank into the center that resulted in the game-control against Real Madrid created a dominant result against PSG where they controlled the rhythm through counterpressing and a great positional attack. Could you do an article on playmaking? Hi AO. Great job in the analysis and thank you for taking the time to do it. I’m surprised no one in this website had a go at the Porto vs Bayern match. I found it incredibly good (scoreline notwithstanding). With relation to this one though, do you think that, had PSG been able to count on Ibra, Motta, Verrati and Thiago Silva, they might have had a fairly good chance of progressing to the semi-finals? The Porto – Bayern match is online on the German page. But I doubt anybody takes the time to translation that rather long report (short: Alonso & Co. can’t handle high pressing). But take a look at the ‘competitors’, Zonalmarking made an analysis. I like the work from AO. Readable and he does not stretch your nerves with too much nerd details that were not important for the result. He talks about the main topics of a game. I hope PSG will do better in the return match, so they’ll be more in the center of the analysis. Cheers. I wanted to see an analysis on the Porto vs Bayern match precisely because of Porto’s pressing, which I think is, and was, sublime (worked wonderfully against Basel in the previous round of the CL). Shame about Danilo and Alex Sandro missing out on the next leg, otherwise I think a huge upset was on. I expect PSG will do better next week with a few players coming back, but I’m afraid the tie is out of reach. Porto’s pressing was intense. But was it very complex? It seems to be quite easy to force some Bayern players into mistakes. Porto knew when to press. But I was not very satisfied (of course) that the first goal was allowed. The ref could have called it a foul when Alonso lost the ball. Martinez was not only up for the ball, he was attacking Alonso’s legs as well. But a ref can let that go. And the foul from Neuer. Many people expect a red card in this situation. But I think this time the ref was right. When the striker plays the ball to the side and his only intention is to seek the contact and get the penalty, you can’t call it an obvious goal scoring opportunity (which would lead to a red card). But of course Alonso’s mistake started all this. Someone mentioned that Alonso was best next to a second holding midfielder, who could cover ground etc. So maybe the single pivot position is not perfect and Bayern should use a double six with Lahm. Or use Lahm as only defensive midfielder, like last season. Maybe Alonso is even better in front of Lahm?! Strategically, it would have been best to keep the one goal deficit. The third is that what will break Bayern’s neck. Knowing when to press, doing it well and forcing mistakes out of Bayern (a side renown for exquisite build up play) is almost as difficult as it gets when it comes to football tactics I believe. And there was also the way they isolated Lahm (59 touches), Muller (37 touches), Lewandowski (37 touches), Gotze (52 touches). Now that was truly impressive. As for the referee’s decisions, and since I’m looking at it from a purely tactical point of view (notice I don’t mention the scoreline), it’s better not to get drawn into that. With regards to Alonso working better with a partner (who can basically do his running for him) I think is a very valid point, but not likely to happen anytime soon as his role under Guardiola is slightly different than in his other teams. Well, attacking player usually have not that many touches (and Götze only played until the 56. minute against Porto). Against Hoffenheim this weekend Lewandowski had 35 touches, Götze had 53, Müller had 63. Lahm did not play, but Gaudino hat 49 (he was substituted in the 57. minute). And Bayern won this game. Of course a different opponent with the quality like Porto will prevent Bayern from their best. We should not compare Bayern of this weeks with Bayern at the beginning of the season or Bayern of last season. What I wanted to say: Alonso and Dante are the two player I would press, they are the two weak spots (speed, first touch, turning fast, positioning, etc.). It was no sophisticated pressing necessary by Porto because both players lost the ball easy. Porto don’t had to hunt two or three players. Porto’s positioning was good, but Bayern showed no movement to make it difficult. And Alonso and Dante made easy mistakes. I can’t blame Porto for scoring early. But Bayern were an easy opponent last Wednesday. Would have been interesting to see Lahm playing the holding midfielder and either Rode in front of him or even Alonso in this unusual role. With Thiago there is a playmaker and Guaardiola should be able to improvise with the defensive midfielder (like he did last season). Great analysis. i particularly liked the detailed description of Iniestas new role, PSGs asymmetrical defending, Messis movement answering it and the red, yellow and blue zones in the graphs. 2. Busquets was brilliant in this match, just like the first 30 minutes against Sevilla. Wow!